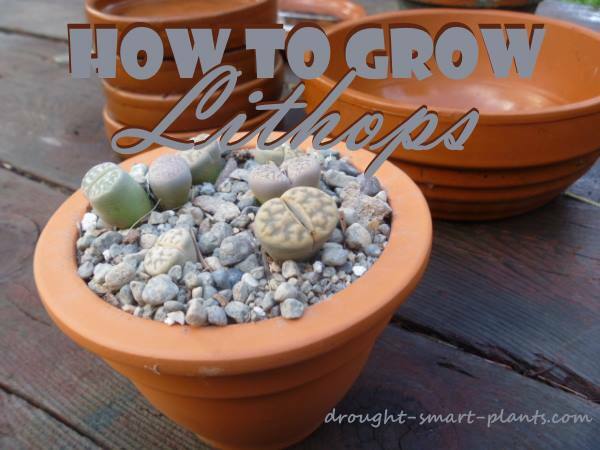 Learn how to grow Lithops, they won’t disappoint you. 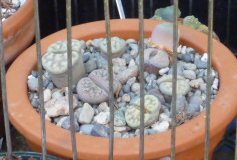 These fascinating 'living stone' plants have adapted to life in captivity very well, as long as a few basic rules are followed. They are among the most successfully adapted to growing indoors of any other succulent house plants. Seed of all species and many cultivars are available mail order from specialist succulent nurseries in Canada, South Africa, U.S., Europe and Asia. Plants can be obtained but they can only be shipped between certain countries and in some cases between states after rigorous inspection and the issuing of certificates to state their freedom from insects and diseases. These xerophytes are relatively easy to grow but somewhat finicky with soil, temperature, time and amount of watering. Special care has to be taken to allow them to adjust to changing light levels by moving them incrementally. If they are suddenly exposed to extremely bright light it can severely damage them and possibly kill them. Lithops prefer a soil mixture that is made up of sandy gravel (e.g. 2 parts sand: 1 part clay loam: 1 part gravel). Add bone meal (phosphorus, like powdered dried chicken bones) and dolomitic lime (calcium, magnesium). Good air circulation is essential, so ventilation or a fan should be used, especially if the greenhouse or room tends to get overheated. They won’t need direct sun all day and should in fact be protected from the direct sun from noon onwards. They will prefer a bright filtered light such as that under shade cloth or behind a sheer curtain, or under grow lights. Water rarely during the late autumn and early winter months as with most succulent plants. Don’t water more often than once every two to four weeks. When you do water, thoroughly drench them to completely soak the soil. Then allow the soil to dry out completely. The best time to water is in the morning so the soil surface can evaporate during the day and dry out the upper levels of soil. My preference is to use tepid rainwater, as this won’t shock the roots, and also won’t leave calcium deposit on the surface of the plant. Avoid using water from a water softening unit or municipal water with chlorine in it as this could kill your plants. Some well water also will have minerals in which although unsightly won’t harm them. It's important not to keep the soil wet. This will kill your Lithops, and quite possibly is the main cause of losing these otherwise very hardy plants. Once the plants start to bloom by splitting open to allow a daisy like flower to emerge, you can pollinate the flowers by hand with a small paintbrush. Each plant is self sterile, so pollen from two or more different plants must be used. Store the seed after the capsule ripens in a cool place where it will be viable for several years. Germinating Lithops seed is easy. Sow the seed during the warmer summer months when it will germinate quickly. The seedlings are very small for a long time, so the quicker they can start to grow the better. Sow the seed evenly in sandy free-draining soil with little or no organic matter in it, and cover with a very thin layer of fine sand. This layer acts to support the young seedling after germination. With such fine seed, it is best to water with a very fine spray or you can dunk the pot into a shallow tray of water to allow capillary action to moisten the whole soil column without disturbing the seeds. Keep the seed pots in a warm bright place, and cover with a sheet of glass or cling wrap to keep the humidity high until the seeds germinate. I've found antique glass cloches are a nice look on the terracotta pots that I prefer. Find out more about seed propagation here. Take the cover off and shake off any large drops of condensation to prevent rotting. Protect from mice and other vermin, which find the succulent little seedlings hard to resist - I use salvaged bird cages or gerbil cages, and cover the plant pots with those. Once the seeds germinate, within three weeks, the seedlings will develop into tiny copies of their parents, although their true colours won’t show for a few months to a year. After the seeds germinate, don’t water from below as this can rot the tiny roots. Once the seedlings are a few months old allow them to dry out between waterings, and this will make them search out deeper layers of soil to obtain moisture. Transplant the tiny plants once they’re big enough to handle at around a year old, and expect to see them start to bloom in turn at about three to four years. Sometimes some of the seeds won’t germinate right away, and seedlings emerge a long time later. This is important as you shouldn’t discard the seed pots until you know for sure that all the seed has germinated. 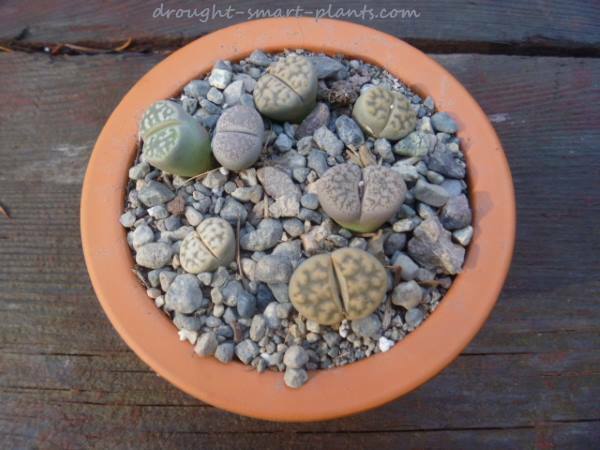 For more information on how to grow Lithops see this interesting blog.